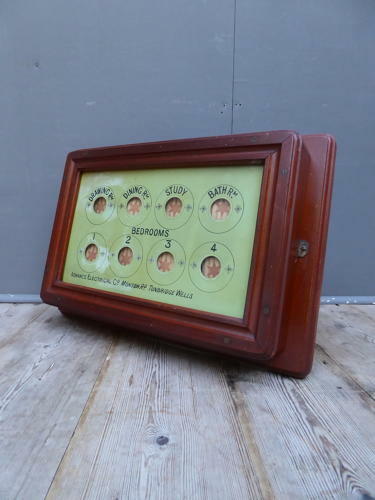 An antique servants bell indicator box by The Advance Electrical Company of Tunbridge Wells. A wonderful early sevants / butlers bell box in a glazed mahogany case with eight indicator windows & original painted tin insert. These boxes would have been wall mounted & when the bell was rung, the flag inside the box would be displayed in the relevant window to indicate which room required service, thus alerting the butler or servant. A fine example & a great looking piece of early technology! In good condition showing the usual signs of age with light discolouration to the tin insert in places. Untested with original wiring seeminly intact but sold as a display piece. UK shipping available at £14 tracked & signed for 24 hour delivery. All electrical items should be checked and/or installed by a qualified electrician prior to use.